The Grace of Gratitude Journal is very unique and special, interspersed with Deborah Perdue’s heartfelt, inspirational thoughts of gratitude, collected from her years of writing in a Journal such as this one; along with Tara Thelen’s exquisite full-color illustrations; and with 55 blank pages for the reader to record their own thoughts of thanksgiving. The combination of words and artwork inspire the reader to more easily count their own blessings. This Journal is hardcover and the pages lay flat. Practicing gratitude on a daily basis using this gorgeous journal provides a vehicle to transform and enrich one’s life, offering sustained peace and more happiness and joy! One cannot be angry or sad, while in a state of gratefulness. That’s why psychologists today are suggesting Gratitude Journals to their depressed patients. 4. and makes a precious gift that makes you feel good when you give it to someone. The Grace of Gratitude Journal is not only for the novice but also for anyone who is already experienced with the spiritual practice of feeling gratitude in his or her life. Being grateful will most certainly transform your life in powerful ways! Grace of Gratitude Volume 2 with gorgeous new artwork, deeper thoughts of thanksgiving by Ms. Perdue and lots more pages to write. Deborah Perdue is the author of several books on Gratitude, www.graceofgratitude.com. Sharing the power of gratitude is her passion and calling! Ms. Perdue is a licensed practitioner for the Center for Spiritual Living. She teaches classes and workshops on the topics of gratitude, abundance and how to live a life of peace and joy. She writes spiritual articles on gratitude and sends out daily thoughts of thanksgiving to her email group. She has introduced to the practice of gratitude on a daily basis ten years ago, watched her life change for the better in fantastic ways, and is now dedicated to spreading gratitude and the practice of it to more and more people. 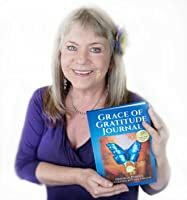 It is her intention that the Grace of Gratitude Journal and her other gratitude books are a blessing to others who wish to uplift their consciousness by practicing gratitude. University, in English (emphasis: creative writing) and Studio Art (emphasis: photography). Her graphic design business, Illumination Graphics, is a rewarding and prospering business. An accomplished graphic designer with over 20 years of experience, she chooses to specialize in the design of book covers and interiors. with her husband, and menagerie.